The aged dark wood of antique colonial furniture may be the first thing you notice walking into Kristi Murrin’s office, at once homey, welcoming and a pocket of Appalachian goodness. She grew up in northern West Virginia, in the former boomtown of Shinnston. 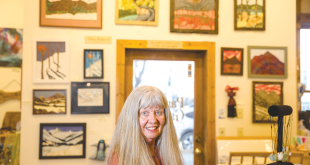 Kristi finds that same community spirit in both Crested Butte and Irwin, the latter also once a booming mining town when silver was king. This is where she chooses to live, in a sparsely inhabited ghost town with only a handful of other hardy Irwinites on a mountainside in her A-frame. At 10,000 feet in altitude, Irwin is accessible only by snowmobile in winter months and became a ghost town when silver was devalued in the late 1800s bust. All the buildings that supported more than 3,000 miners and families—churches, houses, hotels and stores—were either moved or succumbed to the extremely harsh winters and avalanches. “Community is a big thing for me. The two words, community and cooperation, are a theme for me and Irwin is becoming a community for me because I feel like I’m getting to know everybody up there. There’s a lot of talk in Irwin about coming together and being even more of a community,” Kristi says. “There’s only about 18 residents in the winter. You have to transport on a sled and there’s a rough and tough attitude and an adventure lifestyle. I feel blessed every moment.” Kristi smiles at the epic lifestyle that she dreamt of for 15 years, and that finally manifested for her three years ago. Kristi claims to have gotten a head start on skiing because her mother skied while pregnant right up until the time Kristi was born. “My mom was a ski instructor all her life, from the time she was 18,” she says, adding that both of her parents skied. 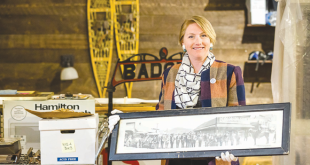 “I was up on skis when I was two years old, when we moved from Plattsburgh, New York to West Virginia and mom taught skiing at Canaan Valley. Our whole lives revolved around skiing. In the summertime we were just waiting for winter to come,” she laughs. Kristi says her mother gave her the name Kristi “because of the Kristi stem turn.” Growing up with ski instructors and their clinics, “Old, chiseled, tanned Germans with maps of German ski areas plastered on their walls,” Kristi became an instructor herself in her freshman year of high school. Realizing she was already deep into student debt at the age of 19, Kristi dropped out of CSU and moved to Winter Park to ski, where she met Steve Melnick and Eric Green, who were living in a ten-foot by ten-foot shack in the woods. “We skied all winter together and came to Crested Butte for a Phish show at WSC in 1992. We realized it was a real community with a health food store and an awesome ski area. Winter Park didn’t have that feel to it,” so by summer of 1993, eight of the Winter Park contingent of friends had moved to Crested Butte. “Most of them are still here,” Kristi smiles. Back in Crested Butte again, Kristi determined she needed four things to exist here—a job, a ski pass, health insurance and a place to live. “I landed a full-time job working at Crested Butte Academy teaching math and science and I was a dorm parent,” she says. 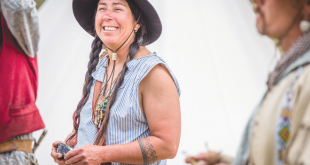 She spent five years at the academy before taking a position back in her native West Virginia to help start a traveling high school for kayaking kids. It allowed her to travel the world with her students—Australia, New Zealand, Costa Rica. When she returned from her world journey of rivers, she walked back into her job at the Crested Butte Academy for a year before heading off to Missoula for six years to teach math and science at yet another traveling high school for kids who kayak. There she developed a curriculum and helped get the school accredited. She finished up teaching with the traveling high school in 2010, returning to the Butte for good because, Kristi says, “I wanted to start teaching yoga and get back into alternative health care.” Signing up for a yoga teacher training retreat in Bali, Kristi notes, “I always knew I wanted to be a yoga instructor even in those first Iyengar classes at Jerry’s gym. I’ve always been a teacher. I love processing info and then delivering it to people in a way they can really understand. I love going all over the world and bringing back new perspectives. I knew I needed more life experience before I could begin teaching,” and with all her years of traveling, teaching and experience, Kristi feels she’s ready to help people. Ayurveda is based in Hindu traditional medicine, and Kristi points out that it’s over 5,000 years old and the oldest documented wellness medicine. It’s based in maintaining balance among the five elements—earth, air, fire, water, space. With Ayurveda, Kristi explains, “I teach people the tools that they can use within this tradition to find balance, physically, emotionally, mentally and spiritually. I do a combination of Ayurveda and homeopathy. The latter is a science developed over 200 years ago and based on the idea that the body has its own ability to heal itself,” Kristi says. She adds, “Ever since I went to Bali, I was introduced to the gamut of knowledge in yoga, which goes way beyond just stretching,” she says of the combined health disciplines.